Gingerbread Cupcakes with Cinnamon Vanilla Buttercream Frosting bring a nostalgic, classic taste to the dessert table this holiday season! Easy to make and beautiful to display, they are sure to delight! Gingerbread is so underrated, don’t ya think? I mean, Gingerbread Cookies have stolen the show for pretty much forever. So, when I started thinking about some new dessert ideas for Christmas and the holiday season, I kept coming back to Gingerbread. What else could I do with the flavor of gingerbread that would be equally as delicious? So, I knew I didn’t want to make classic gingerbread cookies, or try to put any kind of spin on them either. I wanted to make something that I hadn’t had before. And, then bam! It hit me – Gingerbread Cupcakes. Everyone loves cupcakes. It’s downright hard to say “no” to a cupcake! Especially a cupcake with ribbons and ribbons of yummy, sweet frosting. Cupcakes could very well be to blame for the reason so many diets fail. But we’re not talking about diets today. Nope, we’re talking about Gingerbread Cupcakes. So, what makes these Gingerbread Cupcakes so special? Well, to begin, I did quite a bit of research on exactly what combination of spices make up gingerbread. Then, I dug up my tried and true basic cupcake recipe. 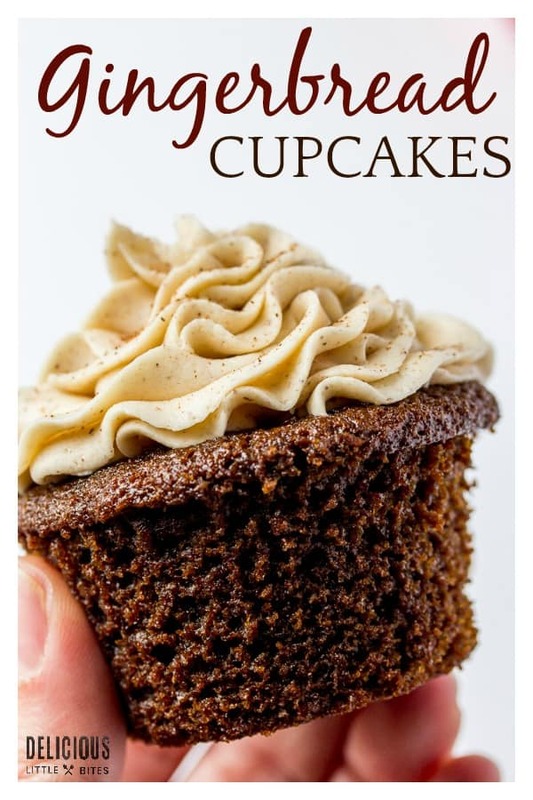 This recipe gives me a solid, moist cupcake every time. I tweaked it a bit, made sure to get just the right amount of every spice in there, and baked! Not to toot my own horn, but toot, toot! Success! Now, the question became, what kind of frosting does one top the most perfect Gingerbread Cupcakes with? Cinnamon Vanilla had to be the flavor, and I ended up going with a buttercream frosting, simply because I didn’t have cream cheese. Sometimes I plan these things out ahead of time, and sometimes it’s all on the fly. Sometimes it all works out, and sometimes it doesn’t. This time, it worked out big time. I might get around to whipping up a Cinnamon Vanilla Cream Cheese Frosting someday, but for now, the combination of Gingerbread Cupcakes and Cinnamon Vanilla Buttercream Frosting is where it’s at. And, it’s dangerous to mess with a good thing. Set the butter, egg, and milk out at least an hour ahead of time to come to room temperature. When you are ready to being baking your Gingerbread Cupcakes, preheat your oven to 350°F. Line a cupcake pan with paper liners. I just love these gingerbread cupcake liners, or these red polka dot ones similar to what I used in these photos. Add the all purpose flour, baking soda, ground cinnamon, ground ginger, ground nutmeg, ground allspice, and salt in a medium bowl. Mix well. In the bowl of an electric mixer, beat the butter and dark brown sugar until well incorporated. Add the egg, then the molasses and blend until combined. Slowly add the milk and then gradually add the flour mixture until evenly blended, scraping down the side of the bowl as necessary. Fill the cupcake wells 2/3rds of the way full. Bake for 18-20 minutes, or until the Gingerbread Cupcakes spring back to touch. You can also use a toothpick in the center of one to make sure it comes out clean. Set the butter out at least an hour ahead of time to come to room temperature. You can set the butter out for the icing at the same time you set the ingredients out for the cupcakes. Add the butter to the bowl of an electric mixer and beat until somewhat whipped. Add the cinnamon and vanilla extract and mix until well incorporated. 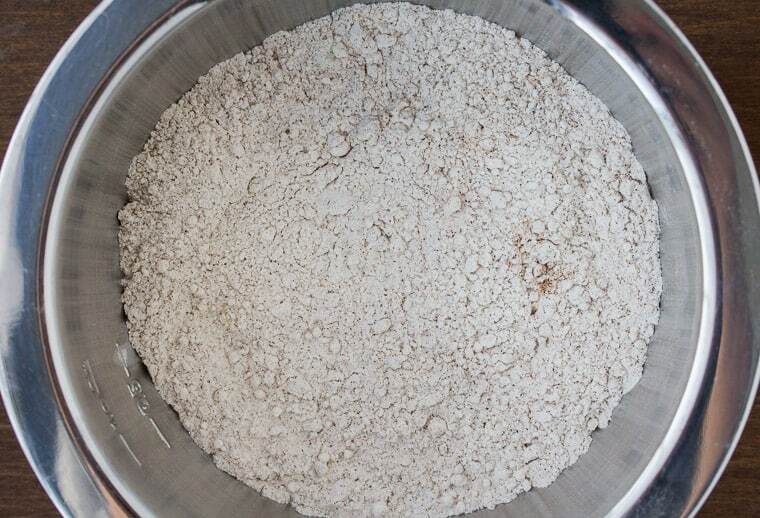 To avoid a big powdery mess, very gradually add the powdered sugar until it’s fully blended and smooth. 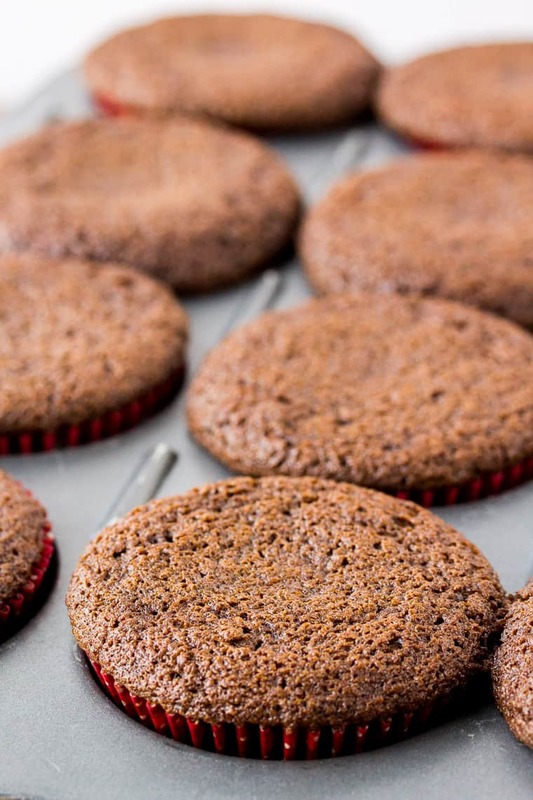 Allow the Gingerbread Cupcakes to fully cool before frosting. 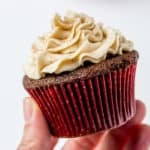 You can apply the Cinnamon Vanilla Buttercream Frosting to the Gingerbread Cupcakes with a butter knife or small spatula, or fancy things up a bit and use a piping bag and tip. For reference the piping tip that I used to apply the buttercream in the photos is a Wilton 2D. Sprinkle on some addition cinnamon and enjoy! Set the butter, egg, and milk out at least an hour before baking to allow them to come to room temperature. 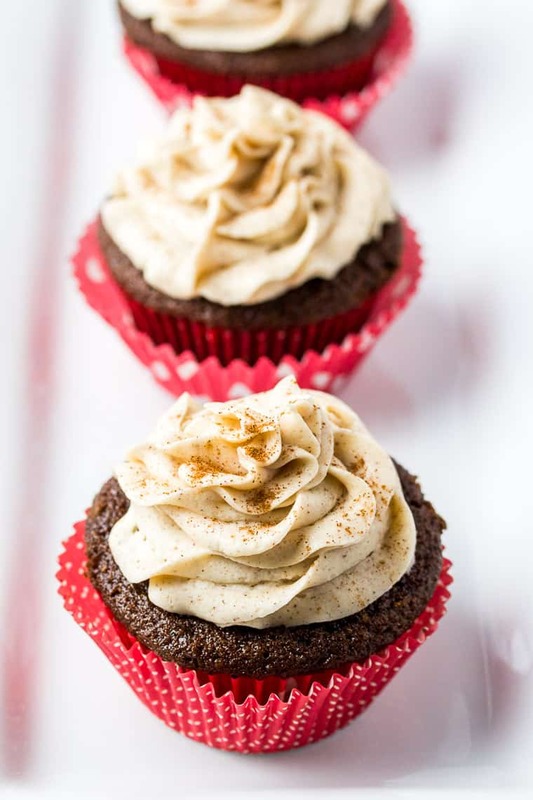 If frosting the Gingerbread Cupcakes immediately after baking, go ahead and set the butter out for the Cinnamon Vanilla Buttercream at the same time. Make your Gingerbread Cupcakes even more festive by using cute cupcake liners like these gingerbread-themed liners or red polka dot liners! 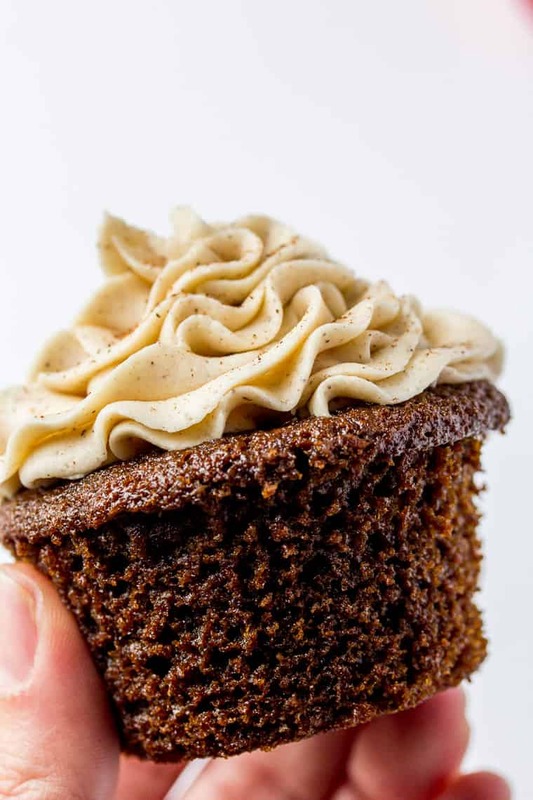 You may need to double the recipe for the Cinnamon Vanilla Buttercream Frosting when using a piping bag and tip for more elaborate frosting designs, like those pictured for this recipe. For reference, the piping tip that I used for the photos in this recipe is a Wilton 2D. 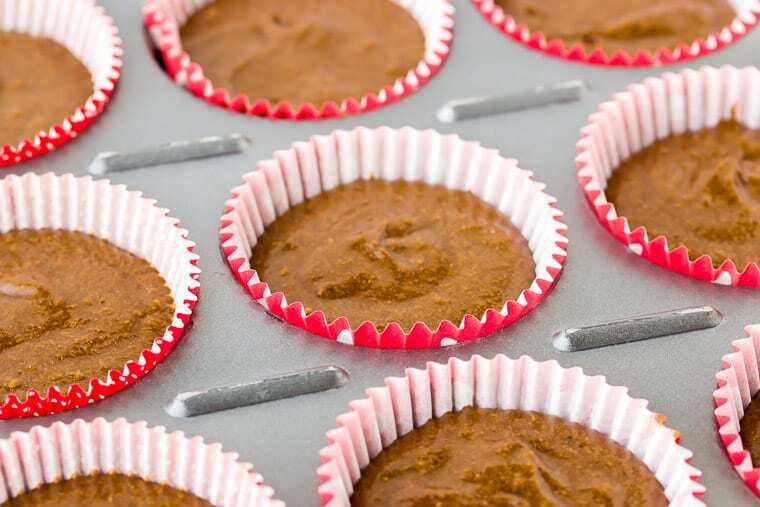 Store Gingerbread Cupcakes in an air-tight container in the refrigerator and use within 7 days. I like this cake pan to store cupcakes in because it has a raised lid to help prevent the frosting from getting ruined. You can freeze un-frosted Gingerbread Cupcakes in plastic freezer bags. For best results, use within 4-6 months. 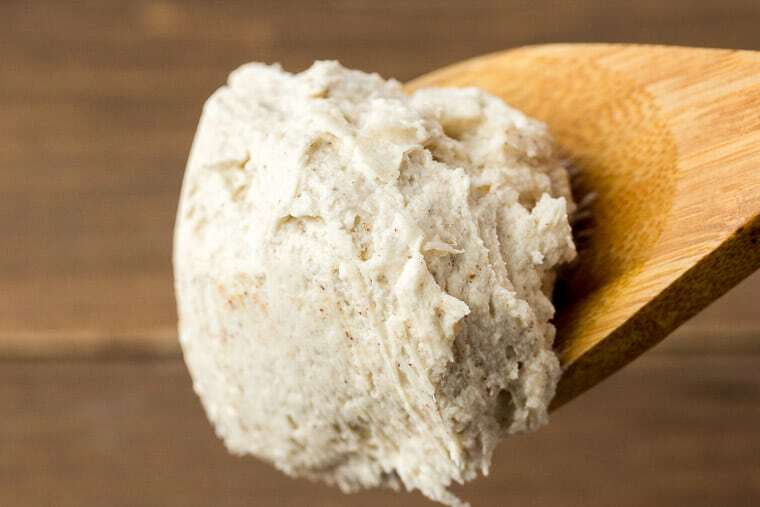 The Cinnamon Vanilla Buttercream can be stored in an air-tight container in the freezer for up to 3 months. 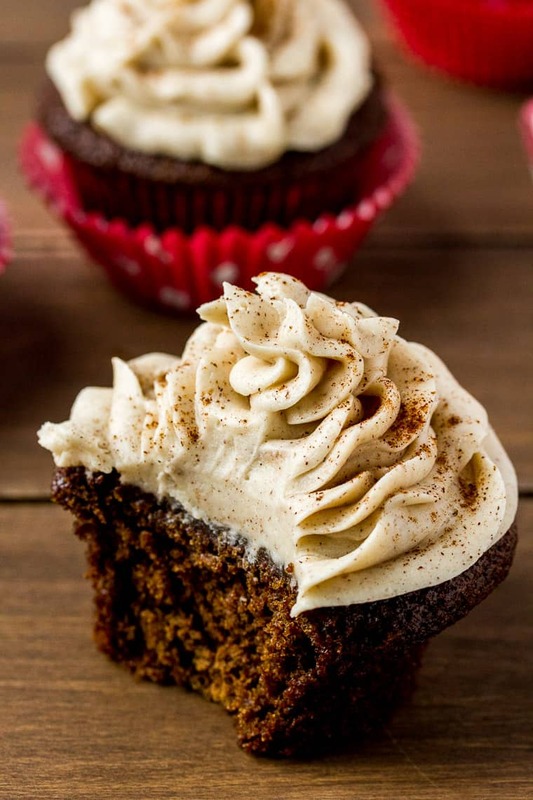 Love this Gingerbread Cupcakes recipe? Follow us on Pinterest, Instagram, and Facebook for more! Combine the all purpose flour, baking soda, ground cinnamon, ground ginger, ground nutmeg, ground allspice, and salt in a medium bowl. Stir well. 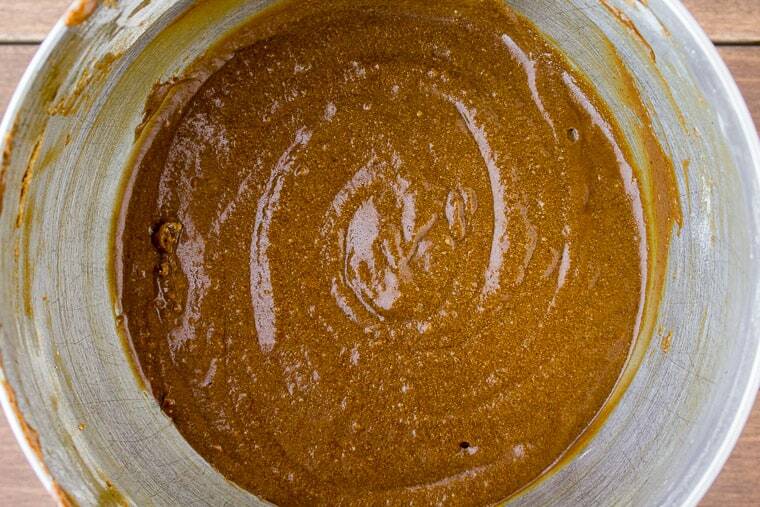 In the bowl of an electric mixer, beat the butter and dark brown sugar until blended. Add the egg, then the molasses and blend until combined. Slowly add the milk and then gradually add the flour mixture until evenly blended, scraping down the side of the bowl as necessary. Fill the cupcake pan wells 2/3rds of the way full. Bake for 18-20 minutes, or until the cupcakes spring back to touch. You can also use a toothpick in the center of one to make sure it comes out clean. Add the butter to the bowl of an electric mixer and beat until somewhat whipped. Mix in the cinnamon and vanilla extract and until evenly incorporated. Very gradually add the powdered sugar until it’s fully blended and smooth. Apply the Cinnamon Vanilla Buttercream Frosting to the Gingerbread Cupcakes with a butter knife, small spatula, or a piping bag and tip.